Running north to south along the western side of Isle au Haut, the Duck Harbor Trail is the main artery that connects the ranger station near town with the tourist hub of Duck Harbor, site of the seasonal boat landing and the small campground. The trail runs 3.5 miles (one-way) and is arguably quicker and more interesting than simply hiking the 5 miles of dirt road between town and Duck Harbor. Although this trail might not be considered a destination hike, there is plenty of good scenery along the way, from the thick forests along the northern sections of the trail to the beautiful coastal views along Moores Harbor and Deep Cove. From the ranger station, follow the Duck Harbor Trail up into the forested hills inside a narrow strip of national park land. The trail then heads south through beautiful forested scenery and a stream crossing before intersecting with the Bowditch Trail and crossing over the dirt road. The trail then heads to the beautiful coastline of Moores Harbor; this is probably the prettiest part of the trail, offering many oceanside views through the trees and several spots that welcome you out to the stone-covered beaches. The trail continues south cutting through the steep hillside under Wentworth Mountain. 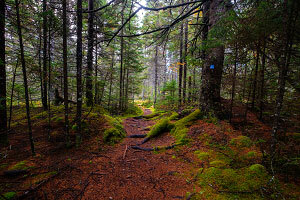 A short spur trail heads down to Deep Cove, a nice little isolated spot with a bubbling stream emptying onto the beach. After the Duck Harbor Trail crosses the dirt road a second time, it begins a slow climb up a hill (elevation 200 ft) that offers a few teaser views of Duck Harbor Mountain in the distance. 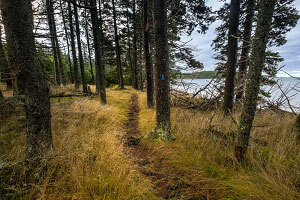 After descending the hill to the south, the trail ends at the dirt road along the north shore of Duck Harbor. From here, you can turn right (west) to hike the short and scenic Ebens Head Trail or turn left (east) to follow the dirt road another .7 miles clockwise around Duck Harbor to the Duck Harbor boat landing and campground. A pump well is located .2 miles east of the campground. The Duck Harbor Trail isn't really a destination hike that day visitors to Isle au Haut should go out of their way to see, but if you have to get from town to Duck Harbor (or vice-versa), this trail is a very pleasant experience through several different sections of scenery.